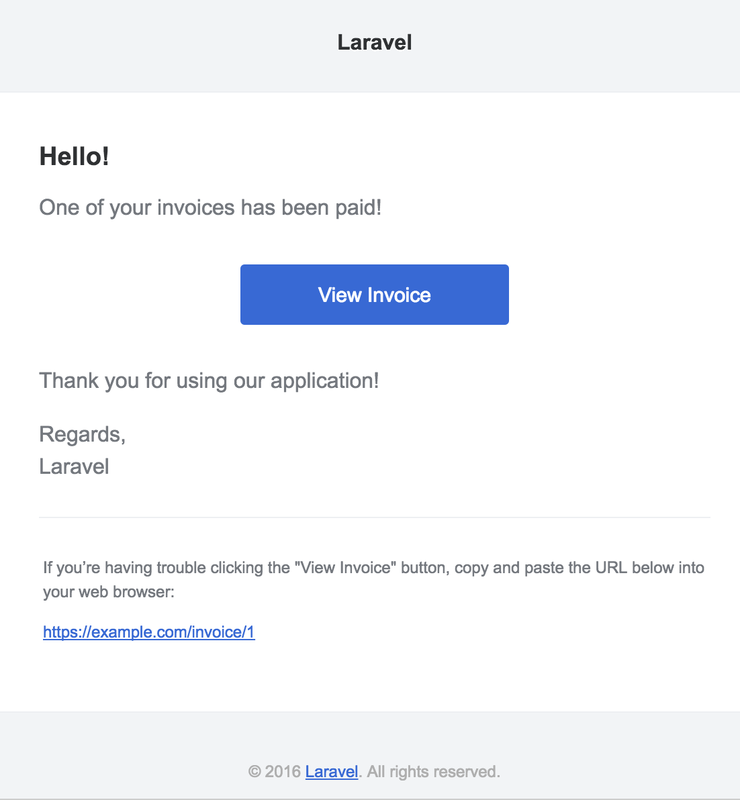 In addition to support for sending email, Laravel provides support for sending notifications across a variety of delivery channels, including mail, SMS (via Nexmo), and Slack. Notifications may also be stored in a database so they may be displayed in your web interface. Typically, notifications should be short, informational messages that notify users of something that occurred in your application. For example, if you are writing a billing application, you might send an "Invoice Paid" notification to your users via the email and SMS channels. This command will place a fresh notification class in your app/Notifications directory. Each notification class contains a via method and a variable number of message building methods (such as toMail or toDatabase) that convert the notification to a message optimized for that particular channel. Tip!! Remember, you may use the Illuminate\Notifications\Notifiable trait on any of your models. You are not limited to only including it on your User model. Every notification class has a via method that determines on which channels the notification will be delivered. Out of the box, notifications may be sent on the mail, database, broadcast, nexmo, and slack channels. Tip!! If you would like to use other delivery channels such as Telegram or Pusher, check out the community driven Laravel Notification Channels website. Note: Before queueing notifications you should configure your queue and start a worker. Tip!! Note we are using $this->invoice->id in our toMail method. You may pass any data your notification needs to generate its message into the notification's constructor. Tip!! When sending mail notifications, be sure to set the name value in your config/app.php configuration file. This value will be used in the header and footer of your mail notification messages. Markdown mail notifications allow you to take advantage of the pre-built templates of mail notifications, while giving you more freedom to write longer, customized messages. Since the messages are written in Markdown, Laravel is able to render beautiful, responsive HTML templates for the messages while also automatically generating a plain-text counterpart. This command will publish the Markdown mail components to the resources/views/vendor/mail directory. The mail directory will contain a html and a markdown directory, each containing their respective representations of every available component. You are free to customize these components however you like. After exporting the components, the resources/views/vendor/mail/html/themes directory will contain a default.css file. You may customize the CSS in this file and your styles will automatically be in-lined within the HTML representations of your Markdown notifications. Tip!! If you would like to build an entirely new theme for the Markdown components, write a new CSS file within the html/themes directory and change the theme option of your mail configuration file. The database notification channel stores the notification information in a database table. This table will contain information such as the notification type as well as custom JSON data that describes the notification. Tip!! In addition to the data you specify, broadcast notifications will also contain a type field containing the class name of the notification. * The channels the user receives notification broadcasts on. The sms_from option is the phone number that your SMS messages will be sent from. You should generate a phone number for your application in the Nexmo control panel. You will also need to configure an "Incoming Webhook" integration for your Slack team. This integration will provide you with a URL you may use when routing Slack notifications. Laravel allows you to send notifications in a locale other than the current language, and will even remember this locale if the notification is queued. Tip!! After registering listeners in your EventServiceProvider, use the event:generate Artisan command to quickly generate listener classes. * Send the given notification. * Get the notification channels.